A swallowing disorder is the inability to swallow food and liquids safely or efficiently. The problem can occur anywhere between the mouth and the stomach. Swallowing problems may be very serious if food goes down the wrong tube (i.e., enters the lungs instead of the stomach) and may cause pneumonia, which can be life threatening. Speech-language pathologists are trained to assess an individual’s ability to swallow safely and efficiently. Depending on the nature of the swallowing difficulty an individual may be given exercises to strengthen muscles involved in chewing and swallowing; they may learn safe swallowing strategies (e.g., posture, feeding behaviours); or may be recommended a special diet (e.g., modified food and/or liquid consistency). Maintain good oral hygiene – always clean your mouth following meals using your tongue and/or a toothbrush. WHAT A NORMAL SWALLOW LOOKS LIKE – ALL IN A COUPLE SECONDS! The lips, teeth and tongue help prepare the food into a compact “bolus” for further stages of swallowing. 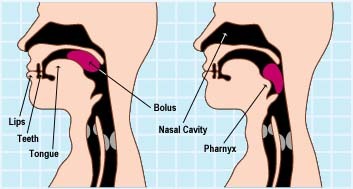 The soft palate (punching bag at the back of your mouth) pushes back to close off access to the nasal cavity and help direct the bolus to the throat. The bolus is propelled into the esophagus, as the epiglottis folds back to protect the entrance to the lungs. 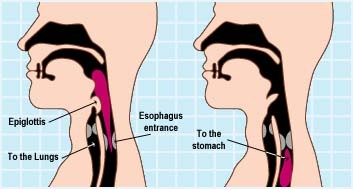 The airway reopens so you can breathe, and the esophagus entrance closes so food stays down, moving toward the stomach. Problems can occur at any or all of the steps along the way.